Anyone who's found their homes burglarized or their cars broken into or stolen is increasingly likely to be a victim of the opioid epidemic. 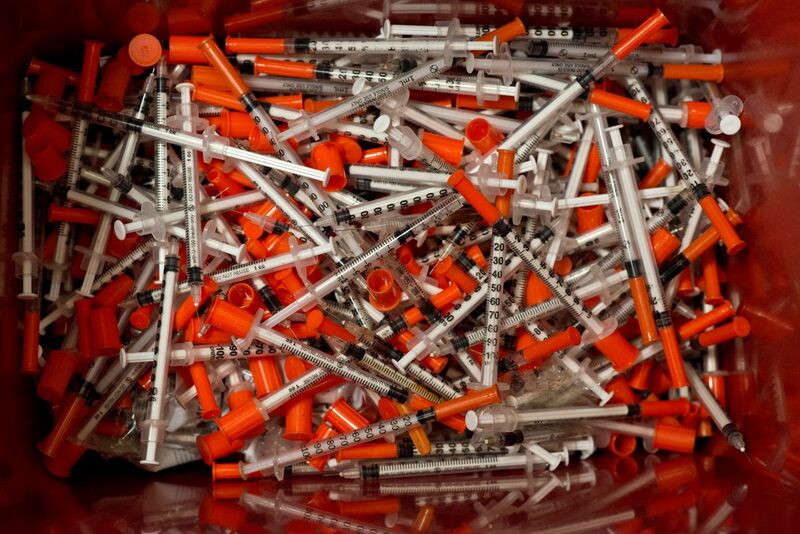 Strewn in parking lot litter and on dog-walk pathways are the spent syringes from someone's latest fix. Families of people lost in the epidemic suffer the greatest grief and the scale of the epidemic and its victims of all kinds cannot be ignored. That's the acknowledgement at conversations to be taken up at town halls, the Alaska Federation of Natives and by government officials at this year's fourth special session of the Alaska Legislature. Other than the kits and the implementation of Project Hope — meant to support to those suffering addiction to help them on the path toward treatment — no expansion of treatment programs have yet occurred, said Rep. Matt Claman, D-Anchorage. Earlier this month, Sen. Lisa Murkowski made an appeal to President Trump to take specific actions after his own declaration of an opioid epidemic in August. Trump said on Oct. 17 from a press conference in the Rose Garden that he plans to unveil the federal response next week. Alaska State Trooper Lt. Steven Adams, with the statewide drug enforcement unit, said there's no doubt most everyone is touched by the opioid epidemic. "I would venture to say the highest percentage of the public is affected either by knowing someone touched by addiction or you may be part of the public that is a victim of property crimes," Adams said. "Of the property crimes that are solved, and we've been able to interview those subjects, it's pretty clear the vehicle break-ins are going to addiction." Retail property crimes carry an economic impact not often talked about. Adams said when stores experience what's called inventory "shrinkage" through theft of high-priced items, they pass those costs to their customers. Jim Calvin, the principal manager on the McDowell Group study, said the opioid crisis has been accelerating to the point that the current economic impact won't be known for years to come. "It's hard to see what trajectory we might be headed toward," Calvin said. "The landscape is changing here a bit on what these costs will look like. We don't have a sense or a full measure of the economic impact, but the trend we know is of growing costs. We are in the billions now." Rep. Claman gave a talk Oct. 17 to the Anchorage Rotary Club about Alaska's current criminal justice issues and the drug epidemic. Claman is chair of the House Judiciary Committee and sits on the Criminal Justice Commission. His primary concern, he said, is the need for more federal funding to help combat the opioid crisis. "If we had more federal funding, we could increase the number of our treatment beds or hire more staff, or support efforts for better use of the treatment beds we have by not being empty for a period of time," Claman said. "We had 400 officers and were cut down to 328 officers; that's nearly a quarter of the APD that was cut," Claman said. "Now we are back with over 400 officers, but many may be in training or not fully operating yet."